The California Academy of Sciences is by far one of the best things to do with kids in San Francisco. 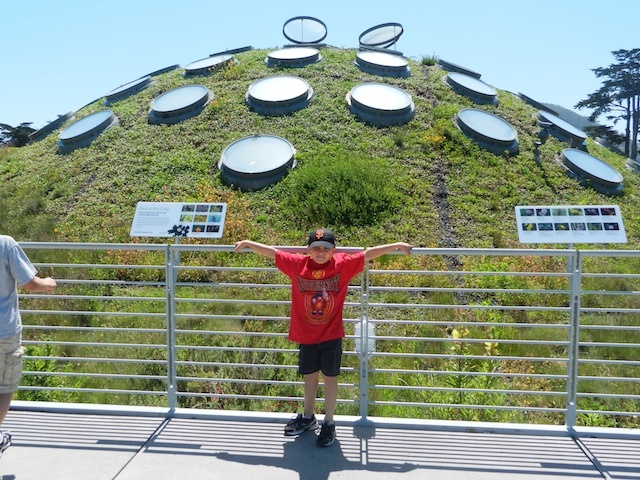 Ideal for school-aged kids but also entertaining for preschoolers and toddlers, the California Academy of Sciences is a trifecta of scientific fun, featuring a planetarium, aquarium, and life science museum all under one (living) roof, which is an exhibit of its own. Families will want to devote at least a half-day at the academy: we stayed a full morning, and still never got to the planetarium (next visit!). Be sure to get a schedule of the day’s events when you enter. On the day of our visit, we were able to catch the African penguin feeding and the tropical fish feeding. Both activities included a talk from a marine biologist and lasted about 15 minutes. The docents at the door of the academy are very helpful in alerting families of the daily activities; we were glad to have them! The academy is set up with two large domes (you’ll spot these from outside). One houses the planetarium, and the other houses the rain forest canopy, a tour along elevated walkways past plants, trees, and many animals (including lots of butterflies and birds). The rain forest canopy will end at the top, where guests can take an elevator down to the ground and basement floor aquarium. (I suppose you could do the various sections of the academy in any order you like, but it flows very well to see the rain forest followed by the aquarium, both in a logistical sense and an educational sense…the exhibits build upon one another.) I think the ‘flooded rain forest floor’ section of the aquarium was my seven-year-old’s favorite spot: he lingered at the rain forest snake section, where he could experience the (simulated) sensation of having his arm constricted by an anaconda. Tip: it’s warm in the rain forest dome; you’ll want to shed sweaters or coats, so be sure to wear layers! After experiencing the rain forest dome, we took the elevator to the top floor of the academy, which is actually the roof. We looked out over the ‘living roof’ exhibit, where acres of rooftop has been seeded and serves as an natural habitat to many animals and birds. It’s lovely on a nice day! Located in Golden Gate Park, an easy drive past the bridge from Highway 101. General admission the the California Academy of Sciences is not cheap at $29.95 for adults, $24.95 for youth ages 12-17, and $19.95 for children 4-11. A much more economical option is to purchase your tickets through a San Francisco CityPASS or Go San Francisco Card . The academy is located at 55 Music Concourse Drive, Golden Gate Park. It’s easily accessible via MUNI bus lines. If you drive, street parking is available, or better yet, try the parking garage near the De Young museum. Note: California Academy os Sciences has a Kidscore of 92. Learn more about Kidscore.